This post provides the 10 best intermediate term bond exchange traded funds of 2012. The top funds are Vanguard Intermediate-Term Bond ETF, iShares Barclays Credit Bond, etc. As part of taxable bond mutual fund, intermediate term bond fund invests mainly in debt obligations or bonds with intermediate term duration (i.e. duration between 5 and 10 years). These funds provide higher yield than short term bond and have higher risks than short term bond as well. 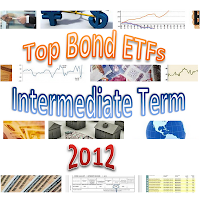 There are about 16 ETFs in this intermediate term bond category. The fund sponsors are Vanguard, iShares, State Street, Guggenheim, PIMCO, Columbia, etc. The expense ratios are in the range of 0.10% and 0.35%. These top intermediate term bond ETFs are selected based on its expense ratio fee, portfolio turnover rate, management or index approach, performance, etc. You can find the fund review and comparison below. Vanguard Intermediate-Term Bond ETF invests majority of its assets in U.S. government, investment grade corporate, and investment-grade international dollar-denominated bonds. Its index benchmark is the Barclays U.S. 5–10 Year Government/Credit Float Adjusted Index. The fund yield is 3.57%. It has $3.87 billion of assets. Morningstar has ranked this taxable bond fund with 5 star rating. It has a 5 year annualized return of 8.81%. If you prefer mutual fund, you can select either the Vanguard Intermediate-Term Bond Index Fund Investor Shares (Ticker: VBIIX) or Vanguard Intermediate-Term Bond Index Fund Admiral Shares (Ticker: VBILX). The investment objective of iShares Barclays Credit Bond fund is to achieve the investment results similar to the Barclays U.S. Credit Bond Index. It has distribution yield of 3.67%. Its expense ratio is 0.20%. The fund inception date is January 5, 2007. This intermediate term bond ETF has returned 9.58% over the past year and 9.63% over the past 3 year. You can buy this ETF from your brokerage as little as 1 share per purchase. The current share price is $ 112.91. Some brokerages that offered this fund are Fidelity, TD Ameritrade, E*Trade, Merrill Edge, Scottrade, etc. Vanguard Total Bond Market ETF invests mainly in mortgage backed securities, U.S. Treasuries, and corporate bonds. With $17 billion of assets, it currently has 2.93% yield. The expense ratio is only 0.10%. The average volume of this ETF is 1.4 million per day. The average bond maturity is 7.2 years. This top intermediate term bond ETF has returned 6.79% over the past 3 year and 6.91% over the past 5 year. It has been able to achieve 5 year consecutive positive return. The lowest return was occurred in 2009 with 3.33%. The SPDR Barclays Capital Aggregate Bond fund has $597 million of assets. The dividend yield is 2.29%. This exchange traded fund is tracking the performance of the Barclays Capital U.S. Aggregate Index. It has a low average volume of 68,564 per day. You might need to use a limit order when you want to buy this ETF. Vanguard Intermediate-Term Corporate Bond Index ETF utilizes its assets to purchase high quality corporate bonds. Its aim is to provide moderate and consistent current income level. The current 52-week range is $79.39-$87.09. The expense ratio is only 0.14%. It has a 1-year average return of 9.77%. This iShares Barclays Intermediate Credit Bond fund is tracking the Barclays U.S. Intermediate Credit Bond Index. It invests in bonds with maturity of between 1 year and 10 years. Its dividend yield is 3.45%. The expense ratio is only 0.2%. The annual holdings turnover rate is only 9%. SPDR Barclays Cap Intermediate Term Corporate Bond fund is rated with 3 stars rating. It focuses its investment in the United States corporate bond market. The total net assets are $292 million. As part of State Street Global Advisors fund, it has an annual expense ratio of 0.16%. It has 3-year average return of 7.48%. The 3 year beta risk is 0.86. As of August 2012, the top 5 holdings are Merrill Lynch Co Inc Mtn Be 6.875%, Morgan Stanley 3.45%, Goldman Sachs Group 5.95%, American Express 7.25%, and Bear Stearns Cos 7.25%. iShares Barclays Aggregate Bond invests in a diversified portfolio of bonds such as mortgage, U.S. Treasuries, and corporate bonds. Its annual expense ratio is 0.20%. This ETF is introduced to investors on September 21, 2003. The SEC yield is 1.68%. This iShares Barclays Government/Credit Bond fund is a 3-star intermediate term bond fund. The total assets are $173 million. Its yield is 2.82%. The top 4 bond sectors are U.S Treasury, Corporate Bond, U.S. Agency, and Non-U.S. government. PIMCO Investment Grade Corporate Bond Index ETF objective is to provide total return by tracking the Bank of America Merrill Lynch US Corporate Index. The expense ratio is 0.20% per year. The average effective duration is 6.28 years. The top 4 holdings are JPMorgan Chase 3.7%, AT&T 6.3%, Verizon Communications 8.75%, and Morgan Stanley 5.5%.